This afternoon I boarded the Carnival Paradise in Tampa - but I didn't set sea. Instead, I witnessed a the reading of Dr. Seuss What Pet Should I get by Tampa Bay Rays all-star third baseman Evan Longoria to summer camp kids. For every home run that Evan Longoria hits during the 2015 season, he and Carnival Cruise lines will donate $100 to Pet Pal Animal Shelter. Pet Pal Animal Shelter is a place close to my heart - they helped me save a Pit Bull from being euthanized. 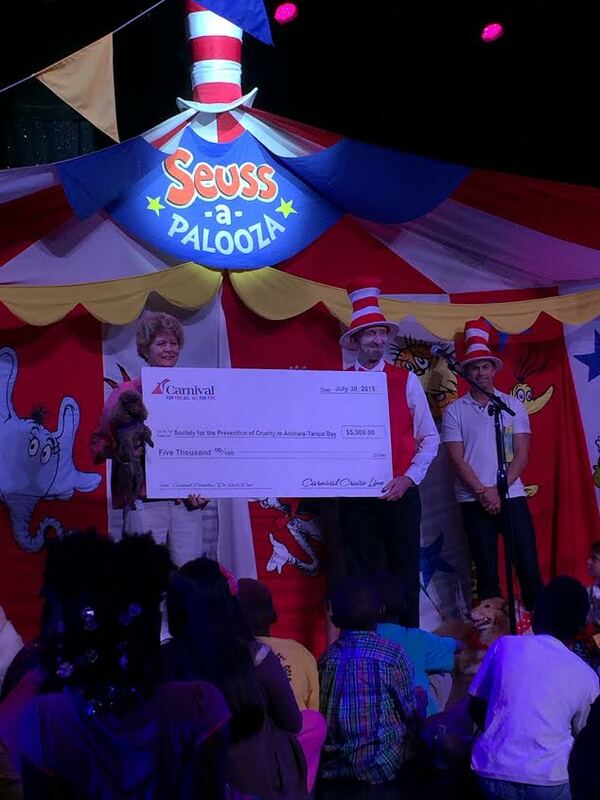 Carnival Cruise Lines also donated $5,000 to the Tampa Bay chapter of the Society for the Prevention of Cruelty to Animals (SPCA). 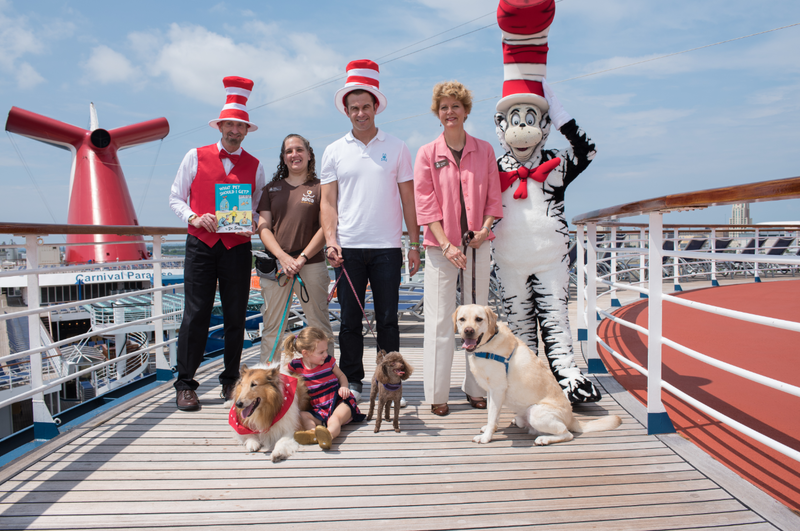 “Carnival is the number one cruise line for families and we’re delighted to team up with Dr. Seuss Enterprises to bring the joy of reading to kids with a special presentation by Rays legend Evan Longoria while supporting animal rescue organizations in the local community,” said Christine Duffy, Carnival’s president. 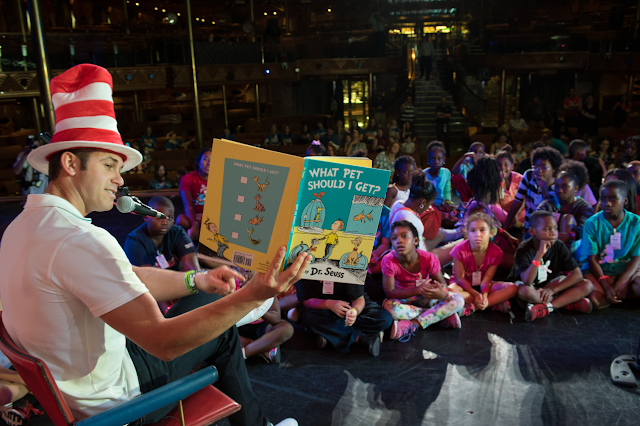 “The kids were absolutely thrilled to be in the presence of an all-star and our most sincere thanks to Evan and the SPCA for the valuable work they do each and every day,” she added. 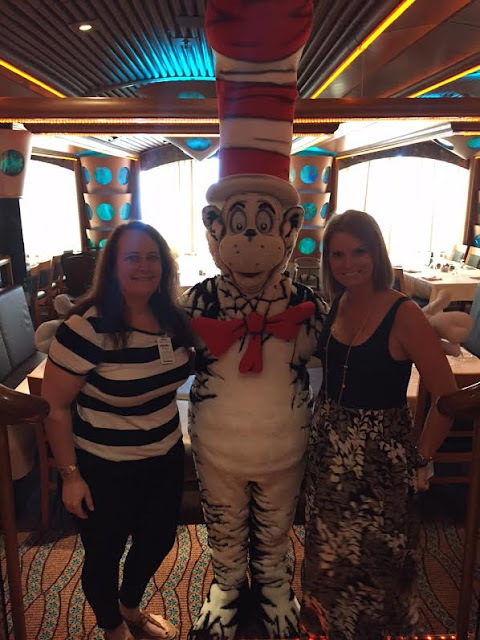 Following the reading, we joined The Cat in the Hat, Sam I Am, and Thing 1 and Thing 2 for Carnival’s popular Green Eggs and Ham Breakfast, part of the cruise line's exclusive Seuss at Sea program. 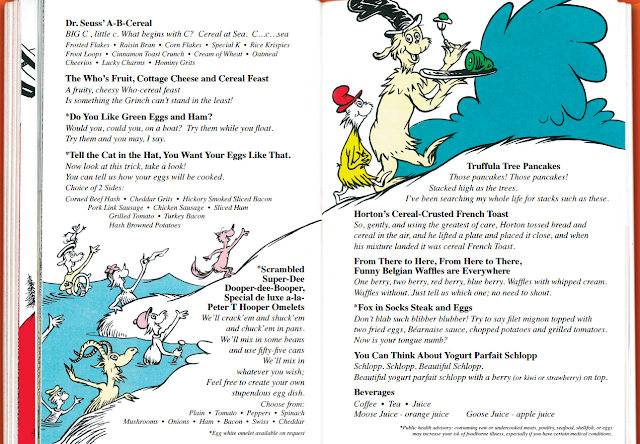 In case you were wondering, Green Eggs and Ham are on the Dr. Seuss Brunch Menu and yes, the eggs are actually green. I opted for Steak and Eggs - or as they say "Fox in Socks Steak and Eggs Don’t blab such blibber blubber! 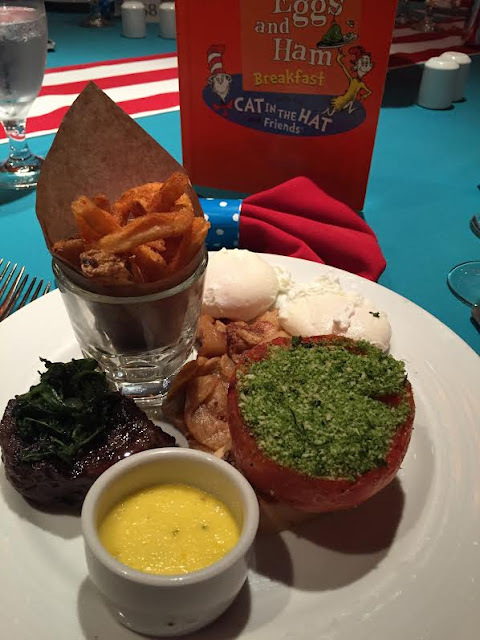 Try to say filet mignon topped with two fried eggs, Béarnaise sauce, chopped potatoes and grilled tomatoes. 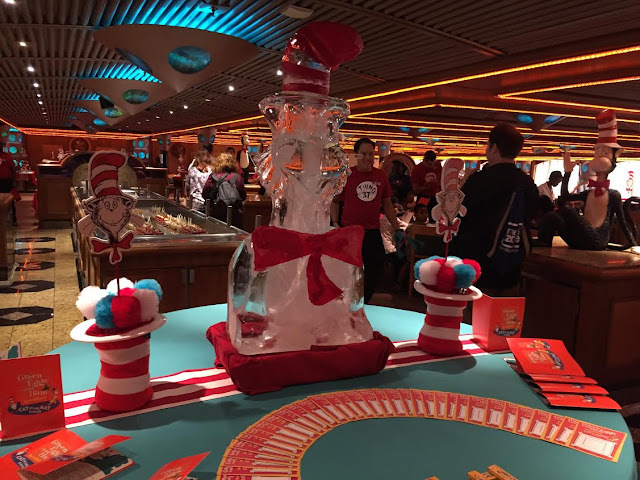 Now is your tongue numb?" Launched in 2014, Seuss at Sea is a fleetwide program featuring exciting youth, family, dining and entertainment experiences inspired by the amazing world and words of Dr. Seuss. 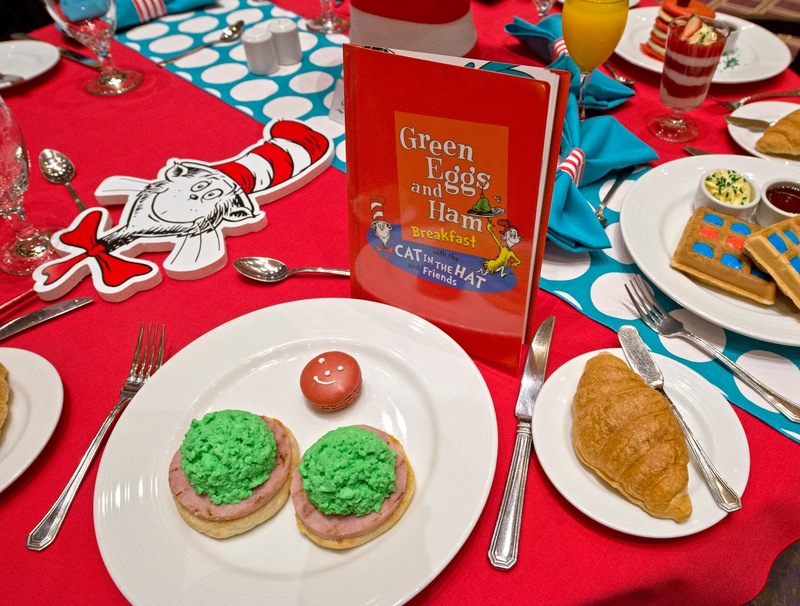 The program includes such fun activities as the Seuss-a-palooza Parade and Story Time, as well as character interactions, Dr. Seuss toys and games and popular movies.